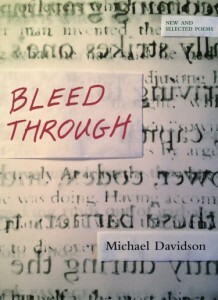 Davidson is well aware of a kind of useful violence latent in the process of reference as a professor of English, but in his poetry he seems to allow himself a moment of reflection. The title suggests that whatever is released by trying to grasp a scene, thing, or person is vital residue, but that the writing itself is in one sense confinement of the energy that suffuses the subject. Confinement here is a communal condition, and materializes as poetry, as criticism, and as image, in ways that are transparent about leaving something out. The ‘leaving something out’ is critical to allowing the subjects room to breathe an air of impossibility, which is what makes these poems semblances of life as a professor. A group of new poems is called ‘Bad Modernism’, scenes ‘between rationalism and whatever is left out’. The subjects that dwell here, in the most recent poems, generally resist being totalized, by way of their gentle intrusions into, and unexplained exits from, the world of each poem. While Davidson’s poetry is often grouped with the language movement, this is probably a bit inaccurate. While sometimes upending grammarians and often explicit about the pitfalls of language, a lyric relationship is still often present, if immaterial. His major output has been criticism, not poems, over the last decade, and this collection, although this collection is hailed as ‘A book we have needed for a very long time‘. I don’t think there’s any literature vital to our survival as a species, but I’m a pessimist unlike Ron Silliman. A grouping of things –systems, signs, speakers– will eventually not exert enough pressure outwards in aggregate to support its superstructure, and this is when collapse is imminent. This poem displays a high correlation between sexual violence and some of the essential components of anglo-american language philosophy which has risen to power in the academy in the aftermath of Wittgenstein. Davidson’s objections to the way of living prevalent in the current academic labor force are present in different ways throughout the collection, although he has been affiliated with UC-San Diego in some capacity for over 30 years. Language poetry at its worst draws attention to its own ineffability while lording the power of the maker in a snide, academic way.There exists no image that contains the pain of having one’s home ravaged by a storm. But one can have so-called ‘philosophical’ interests and admit to being powerless before them. Language poetry at its best seems to perform a collapse of the rules of its system for a user of the language. Davidson’s work is filled with such moments of open vulnerability before the operations of the various systems. After one listens to so much loud music, deafness falls, but once everything is pictured what will become of the shadows? A bleak portrait of the state of the youth. The ‘I’ begins the poem without time to be unhappy, and is gradually eroded by the work of festooning a reception area for partygoers, who demand history and interpretation among other things. At the last moment the second-person juts into the poem, and it closes “ the smell you smell afar / is something boiling over.” There is a twinge of concern for the environment in the newer poems, although they still mostly operate within cityscapes, oblique but identifiable by landmarks and the occasional proper noun. Bleed Through bears the mark of struggle of writing poems and the violence latent in the revision of the categories embedded in the way one comes to terms with the world. CJ Morello is a poet from Chicago. His work is forthcoming in Gigantic magazine. Find him at cjmorello.com or @siegethethird on twitter.